The company drew the ire of Bernie Sanders last month, sending its shares spiraling downwards. Shares of the rare-cancer specialist Ariad Pharmaceuticals (NASDAQ:ARIA) shed more than 35% of their value in October, according to data from S&P Global Market Intelligence. Apart from the marketwide headwinds that stung nearly all biotechs last month, Ariad was also negatively impacted by Senator Bernie Sanders' tweets openly criticizing the company's repeated price hikes for its flagship leukemia drug Iclusig. Iclusig's price tag now stands at a whopping $199,000, despite being a treatment of last resort for most patients. Sanders is basically accusing Ariad of price gouging as a way to compensate for Iclusig's revised label that was rolled out in 2013. As a reminder, Iclusig was briefly taken off the market due to the risk of life-threatening blood clots. And when the drug reemerged, it did so with a much stricter label that seemingly cut its peak annual sales potential from $425 million to $300 million. If we dig a bit deeper, though, this price-gouging claim may, in fact, not be warranted. The short story is that Iclusig's price has climbed at a compound annual growth rate of 9.58% since approval. While that may sound like a hefty price increase, it's actually a tad lower than the national average (10% annual appreciation) for cancer drugs over the last two decades. Image source: Flickr via user Gage Skidmore. Of course, there are compelling arguments to be made that most, if not all, cancer drugs are wildly overpriced in the U.S. and a 10% annual price hike, on average, is egregious. But the truth is that Ariad isn't doing anything out of step with the industry at large, and Iclusig's price scheme arguably pales in comparison to some of the more cringeworthy stories like the EpiPen that have been grabbing headlines lately. 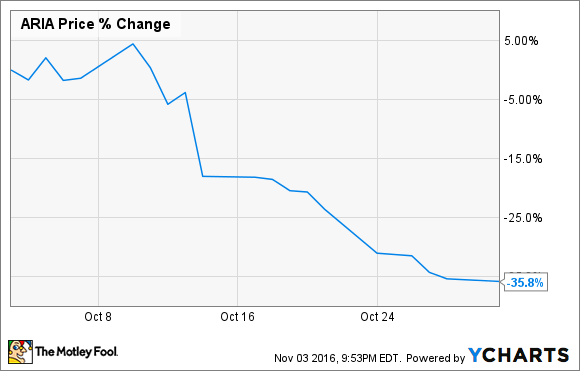 Is Ariad cheap following this steep drop-off? My view is that Ariad is actually fairly valued at current levels, assuming the company is successful at grabbing a regulatory approval for its ALK+ non-small cell lung cancer treatment brigatinib next year. The bottom line is that Ariad's valuation took a rather questionable swing upwards earlier this year on the news that a buyer may be lurking in the shadows. But now that Ariad has given back a fair amount of these gains, I think it does come across as a more compelling long-term buy. That said, investors should probably expect additional volatility emanating from the drug-pricing debate moving forward.